The team finished the regular season with an overall record of 11-5 and an impressive 6-2 record away from home. Head coach Rastko Popovic credits the team’s success to discipline, focus and maturity. “I’m really impressed with our guys. They took major steps forward despite having players leave midseason, we had guys step up to the plate and deliver,” said Popovic. The Stingers began the season with a bang, defeating Bishop’s University 88-71 in their home opener. They cruised to 3-1 before the winter break; connecting on all cylinders. However, their good fortune and chemistry couldn’t last forever. They stumbled, losing three games out of five in January. They suffered defeats to arch rivals, McGill and Laval. Freshman Anthony Sanogo made key contributions to the offence during the second half of the season. “In spite of his slow start, he was able to develop and become a key part of our offence” said Popovic. Adrien Armstrong was another impressive break out for the Stingers. Armstrong was an unsigned player from Dawson who put in the extra effort to improving his game. A three-point assassin, Adrien finished the season with 22 three-pointers made, second only to teammate Ricardo Monge. 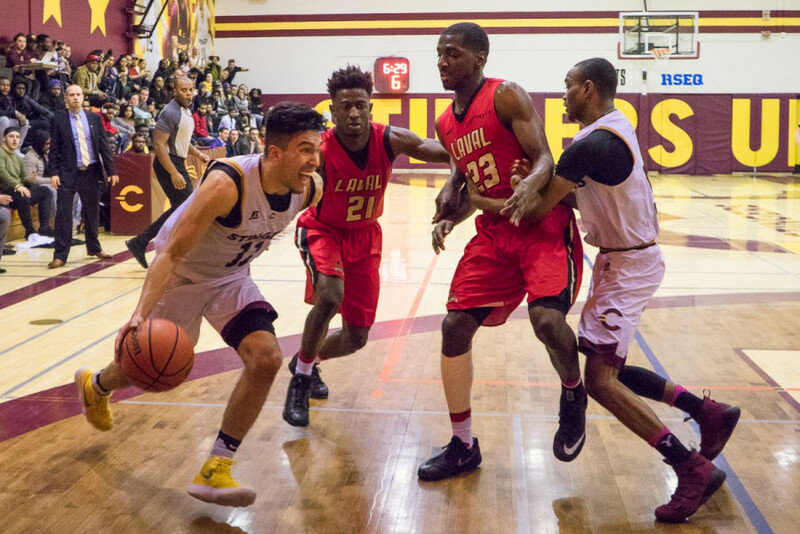 The Stingers headed into the post-season facing ULaval at home, a team they had bested twice in the regular season. The game was intense, the atmosphere was vibrant and loud, the crowd was cheerful; all the right ingredients for a playoff game. Guided by the emotional hostility of the fans, the Stingers were able to put the game out of reach in the fourth quarter, ending things with a score of 72-63. This playoff win proved to be much more substantial than a trip to the finals. It was a stand out moment for Popovic, where he says he witnessed his team grow and evolve. “I think this game really accentuated our team’s maturity. We took a double digit lead heading into the third quarter, however Laval’s resiliency got them back in the game,” said Popovic. 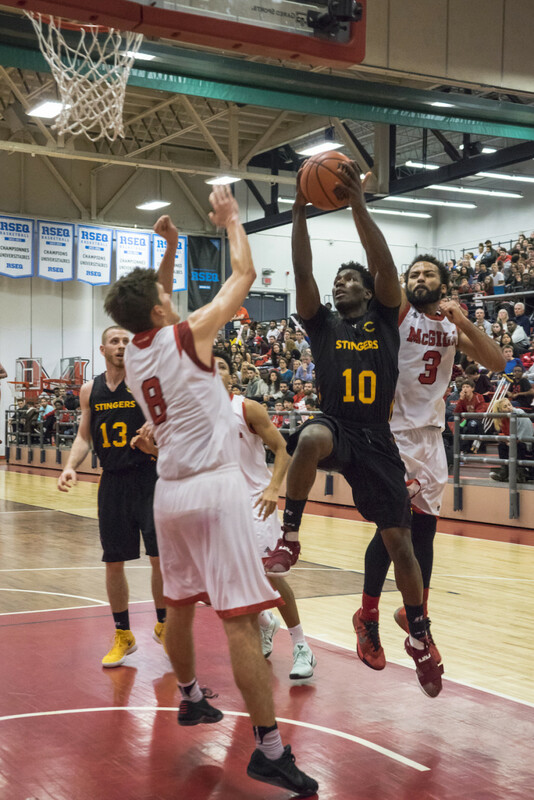 The Stingers faced off against long time rival McGill Redmen in the finals. McGill had their number during the season, beating the Stingers in three out of four meetings. Popovic knew it would not be an easy game but coming off an emotional win against Laval, Concordia still had momentum. The game was deadlocked at 21 after the first quarter. The second and third quarters were dominated by McGill as they outscored their opponent 52-29. 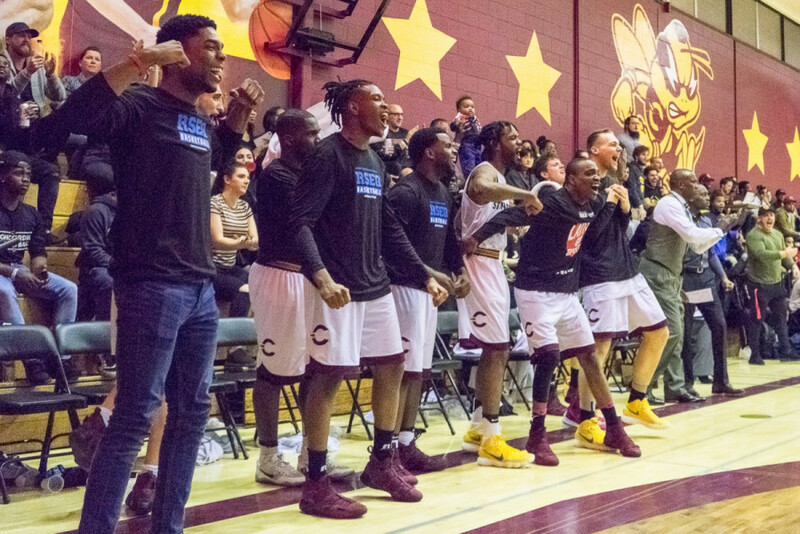 Concordia battled back late in the fourth behind a team high 19-point performance from Ricardo Monge, but the comeback fell short and The Stingers season came to an end with a 98-79 loss. “Overall it was a good year. The goal was to win the league, but we lost to an experienced team. We’re gonna prepare, watch film and make the necessary improvements to help us get to the next level,” said Popovic of the loss. With notable seniors leaving the team this year, the coaching staff has multiple holes to fill. Ken Beaulieu is a name hard to forget if you’re familiar with the team. Beaulieu averaged 31.1 minutes per game and was arguably the heart and soul of the team. He ends his career averaging 12.6 ppg this season. “You can’t replace Ken. He was a focal point in our offence and defense,” said Popovic. The coach and his staff will depend heavily on fifth year guard Ricardo Monge to carry the burden of Beaulieu’s loss. Monge is an excellent shooter, floor general and leader. His work ethic also translates off the court. He is graduating in finance and wishes to pursue graduate studies once his career ends. Monge admits that this season was an uphill battle filled with many obstacles, but that the team stayed synchronised and focused. “We lost to a good team in the semi-final but we played hard and left it all out there. The guys we had left were the guys who really wanted to be there and play” he adds. The fifth year point guard also believes this off season will be beneficial for the newly signed commits, and emphasized the fact that the preseason games against division one opponents will undoubtedly set a tone for the season, preparing new players both physically and mentally. He recalls how much he learned in his first couple of seasons and as a leader and veteran, the value of understanding the culture is a player’s primary responsibility. Ultimately, Popovic stresses the fact that this is a new season and a new year—players will have the chance to prove themselves and earn their minutes. “Nevertheless, it will be a collective effort going forward if we want to get to where we need to be,” he added. After participating in the NCAA final four Q&A sessions, Popovic plans to implement key lessons he learned from future Hall-of-Famer and mentor Gregg Popovich to next season’s approach.